1. To insert an image into a post or page, first open the post/page in your Wordpress dashboard. 2. Click your cursor in the text box where you want to place your image. 3. Click the Add Media button, which can be found just above the text box. Upload a new image or images by clicking on "Upload Files"
5. Once you have uploaded the image(s) you want to insert, click Insert into Post. Wherever your cursor was placed, your image will be inserted in that spot. You can click on the "Size" drop-down to select a size. Rule of thumb for images: You always want your images to be larger than the post area. Your theme will automatically size your image down to fit perfectly in the post. This is how all of the images in our demos are set. If you use an image that is not larger than the post area, it will NOT be stretched larger to fit. Best practice for images: choose the smallest image size available that is AT LEAST 800px wide. In the screenshot above, the "Large" image size is 1024px, so we would choose that size for our image. If the Full Size option for your image is very big, as our example is, using that size will slow your site a little (especially if you have lots of big images). The image size options you have will depend on the original size of the image, so if your Full Size option is only 900px, you can use that size with no problems. If you want to change the size of an image that has already been inserted into your post, here's how: In the post editor, click on the image. A toolbar will appear at the top of the image. Click the pencil icon (edit). An Image Details box will pop up where you can change the image size. Click on the image in the post/page editor. A toolbar will appear above the image. Click the pencil icon (Edit) to open the Image Details window. 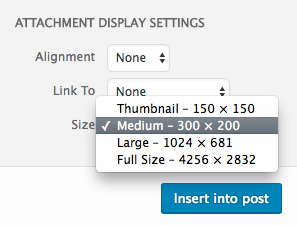 Under Display Settings > Size, select the size you would like the image to display at. In the post/page editor, click on the image you want to align. A toolbar will appear at the top of the image. You can select your preferred alignment in the toolbar. You can also choose an alignment before you insert an image into your post. When you have an image selected in the Media window, you can find the alignment options in the bottom left under Display Settings.